Mix the sugar, honey, molasses, butter and salt in a saucepan and bring to a boil on medium to low heat, stirring constantly. Remove the saucepan from the heat, and then add the nuts and the chocolate chips. Beat the eggs in a separate bowl with a whisk and then add them to the filling. Let the filling cool slightly, before putting it into the warm pie shell. 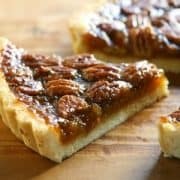 You might need to put the pie shell back into the oven to warm it up before adding the pecan filling. Bake in the lower third of an oven at 350F for 35 to 45 minutes. This pie is amazing served warm with a scoop of French Vanilla Ice Cream.